Let’s cut to the chase, when a bright orangey-red TRD Pro Series Toyota Tacoma arrived at our office, it was hard not to act like 17-year old boys. But in the graces of keeping our relationship with Toyota a happy one, and seeing how our insurance doesn’t cover extreme testaments of vehicle capabilities, we’re forced to act like sensible adults. Unfortunately. Still, that won’t stop us from having a wee bit of fun. When it came time to offer an off-road motivated Tacoma, Toyota supposed it would be best to tackle their TRD budget towards enhancing its off-road skills verses upgrading some of its archaic technology. Hence for 2015 this TRD Pro Series is fitted to the same Tacoma that’s been with us for over a decade – thus, also making it the last hurrah before the next-gen Tacoma (coming this fall) kicks it to the curb. To set things out of the norm, it is easy to identify a Pro series vehicle (also featured on the current-gen Tundra & 4Runner), and not by its zesty Inferno paint or blacked-out TRD Pro badges. But by the masculine blacked-out Toyota badged grille, chunky dude-approved all-terrain BF Goodrich tires with 16-inch black TRD wheels, and Bilstein off-road shocks. If you don’t also notice, ride height has been adjusted adding nearly two additional inches of ground clearance, which also increases your approach and departure angles for the some of you serious off-roaders out there. Before we get to what this TRD Pro Series Tacoma was designed for, we must evaluate what it’s like to live with every day. It’s in our title: …the everyday driver. Even though on the outside things are spiced up with the TRD enhancements – once you get behind the wheel, this Tacoma becomes one of the most annoying vehicles we’ve ever driven. At speeds above 50 mph the tires hum that constant drone, that exhaust note we once found cool when we were teenagers (10 years ago) is like a constant ringing in the ear that will never go away, and when you apply the brakes, it nose dives like a hawk going after cute little fuzzy bunnies for its afternoon snack. Underneath that hood scoop lies a pretentious old-school 4.0-liter naturally aspirated V-6 mated to a five-speed automatic. Capable of using all 236-horsepower it will go from zero to 60 mph in just over 7 seconds and will take nearly a day to stop all 4400lbs. And at 266lb-ft of torque, it can maneuver itself out of any situation or leave a good set of treads at the light. Being the kind of its current-gen model, the interior is full of its hard-coarse plastic and funky materials. Our featured gray cloth seats surprisingly felt of decent quality – something to live up to the elements of its owners. The seats here are manual all the way with very limited adjustments, meaning they’re not very comfortable nor supportive. With our featured double cab, there is room in the back for three of your mates – it’ll be a tight squeeze but there is some breathing leg and head room. Don’t have any friends? Lift up the rear seats to reveal some cargo holes or fold them flat for additional cargo carrying needs. Our tester is has high as you can go amongst the Tacoma line-up, and with that it does feature some of the latest infotainment technology like the 6.1-inch color touch screen display. Featuring Navigation, Back-up Camera, Bluetooth, and Sirius XM with Weather and Traffic updates – it’s very intuitive and easy to use while on the go. All the way in the way in the back of the bed, our tester even featured 110-volt outlet for campers that needs to watch a little television, charge their laptop, or blend their morning kale smoothie beverage. 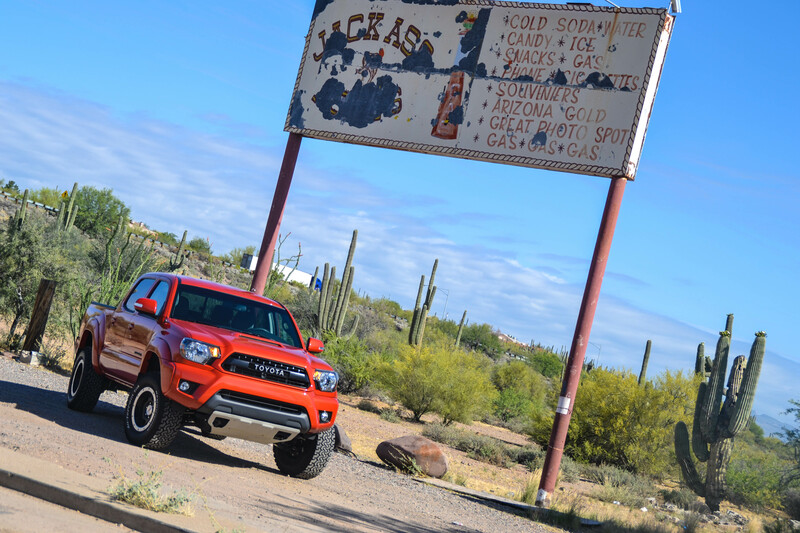 Designed for the extremist of adventurers… The TRD Pro Tacoma fits perfectly right here in our backyard of the Arizona desert. So we went and had a little fun… can you blame us? We took a crack at a Jeep trail in the infamous Red Rock Mountains of Sedona known as Schnebly Hill. Now it’s not an extreme trail – remember our insurance doesn’t cover stupidity – but it’s a light trail to test out the suspension and all the buttons on the dash that do all sorts of exciting things. Since our trail ended up being perhaps a bit too easy for the TRD Pro – we really didn’t get the chance to test the locking-rear differential, or the A-TRAC system, or for that matter even make a tiny scuff on our optioned $205 skid plate. But since we already tested most of that on the Toyota 4Runner last year, we needless-to-say already know it will get us out of anything hairy. What we can say is that once we hit the dirt road – the bone crushing Bilstien shocks became even worst to deal with and the handling became even more wobbly and difficult to manage. We spent more time concentrating on a smoother ride than enjoy the patches of mud we occasionally found. At an as tested price of $39,579, the TRD Pro Series Tacoma is ridiculous. And we love it! It’s the truck of all trucks – its uncomfortable, difficult to drive, obnoxious, and expensive, yet its rugged, capable, a do-all – go anywhere machine, and just plain out right awesome! “Dude-approved” tires! BF Goodrich needs to make that their new tagline. I think I did find a trip-meter in it. Teeny black button embedded in one of the clusters. I pressed it in and it toggled between the trips. Just FYI. Nice write-up! !